A new product that we have recently started integrating into High End Performance Vehicles is the new GHOST System by Autowatch UK. This is a Covert immobilisation system that prevents Keyless Entry Theft or Key Cloning which is on the increase in the UK. It’s effective in preventing your car being stolen even if the keys have been taken. It prevents your vehicle from being stolen or moved unless a “Secret” Pin Code is entered via your standard factory controls. Until this is done your vehicle will not start or move. Modern day vehicles such as Mercedes, Audi, BMW and Ford have seen a big spike in thefts over the last few months. Every day it seems in the news or on Social Media that more and more high end vehicles are being stolen with and without the owners’ key. The video below shows how quickly a Brand new £60,000 BMW and a Mercedes were stolen using devices (As cheap as £80) that were bought online that allowed the hackers to drive away in under 60secs. In 2015 it was estimated that 6000 vehicles were stolen just in London by Gangs using “Keyless” Techniques. It affects mainly vehicles with the Keyless Entry system as seen in BMW, VW, Audi and Ford but can also affect regular “key ignition” vehicles too. This occurs when two criminials work together to break into cars which have keyless entry systems. One thief stands by the car with a transmitter, while the other stands by the house with another, which picks up the signal from the key which is usually kept near the front door on a table or hook. Technically, any vehicle with keyless entry could be vulnerable to relay theft. Once installed it’s highly secure and offers no frequency that can be detected making it untraceable. Your car will simply fail to start or move unless your Pin Code is entered prior to Engine Start. Even if the car thieves have access to your Keys, Keyless Entry Code or Try and Code new keys via your OBD Port this will fail and your vehicle will not move. 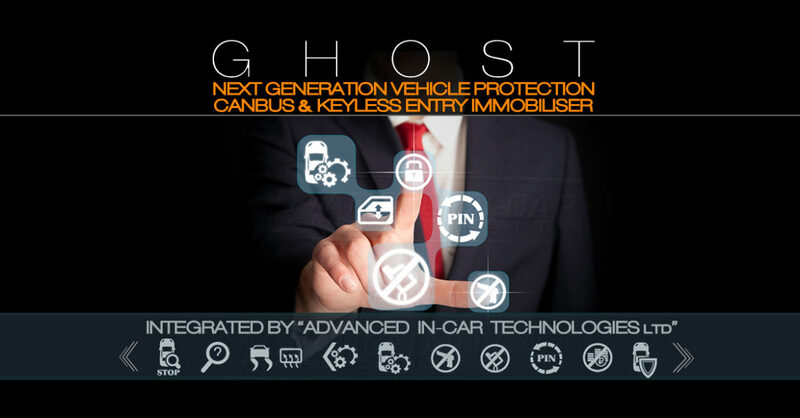 The Ghost immobiliser has no key-fobs or LED indications to give away its location. The Ghost uses the buttons in your vehicle such as those on the steering wheel, door panels or centre console, to allow you to make a unique, changeable, PIN code sequence that must first be entered before you can drive your car. The video below shows an example of how Autowatch Ghost works on a 2017 Audi A6 Avant. As a result of thorough testing, each Ghost System is unique to the owner and the vehicle. Due to the nature of the data bus communication, the Ghost has been adapted and tested for every vehicle that is listed as compatible.